Baigrie BD, Thompson AM, Flower TP. 2014. Interspecific signalling between mutualists: food-thieving drongos use a cooperative sentinel call to manipulate foraging partners. Proceedings of the Royal Society, B 281: online. Abstract. Interspecific communication is common in nature, particularly between mutualists. However, whether signals evolved for communication with other species, or are in fact conspecific signals eavesdropped upon by partners, is often unclear. Fork-tailed drongos (Dicrurus adsimilis) associate with mixed-species groups and often produce true alarms at predators, whereupon associating species flee to cover, but also false alarms to steal associating species' food (kleptoparasitism). Despite such deception, associating species respond to drongo non-alarm calls by increasing their foraging and decreasing vigilance. Yet, whether these calls represent interspecific sentinel signals remains unknown. We show that drongos produced a specific sentinel call when foraging with a common associate, the sociable weaver ( Philetairus socius), but not when alone. Weavers increased their foraging and decreased vigilance when naturally associating with drongos, and in response to sentinel call playback. Further, drongos sentinel-called more often when weavers were moving, and weavers approached sentinel calls, suggesting a recruitment function. Finally, drongos sentinel-called when weavers fled following false alarms, thereby reducing disruption to weaver foraging time. Results therefore provide evidence of an 'all clear' signal that mitigates the cost of inaccurate communication. Our results suggest that drongos enhance exploitation of a foraging mutualist through coevolution of interspecific sentinel signals. The study was undertaken in the xeric savannah Kuruman River Reserve, Northern Cape, from April to May 2013. 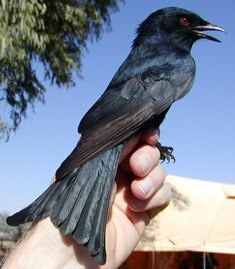 The authors collected observations and experiments on 12 wild Sociable Weaver colonies, and observed interactions with 96 wild Fork-tailed Drongos that were individually colour ringed. Read more about the Sociable Weaver.